This month, the 2012 Community Safety Public Survey was released by Havering Community and Police Consultative Group. This survey gaged people's perceptions of crime in Havering. 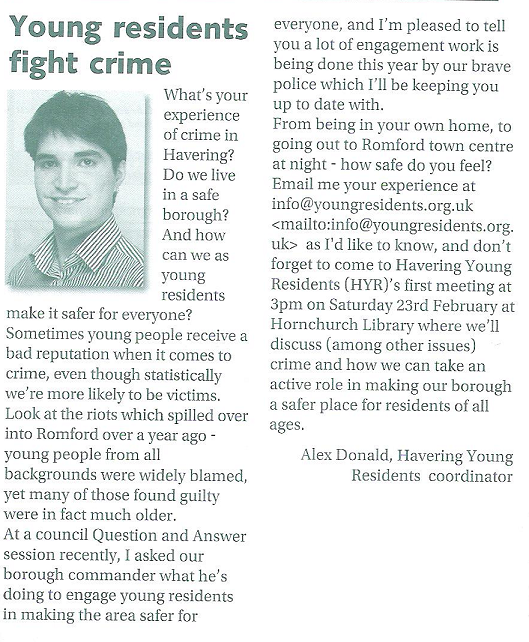 Some of the things which stood out: 79.7% had never been a victim of crime in Havering. In the last 12 months, 11.3% had been a victim in their local area while 5.1% had been a victim of crime somewhere in the borough. Residential burglary concerned most people, with street muggings being the largest secondary concern. Regarding perceptions of how 'safe' Havering is, 66.2% felt our borough was just as safe as 1 year ago, with 19.9% feeling we're safer, and 13.9% feeling we're less safe. The largest age group to respond was the 45-55 range. Unfortunately, the survey admits that "those under 25 account for just over 12% which is better than we usually secure but disappointing." Engaging young residents with the police is important for everyone. If our interests aren't represented, we'll become marginalised. If our voices are heard, we'll have a greater role to play in our community. 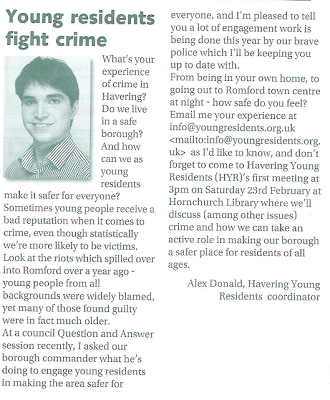 This is why one of my aims for next month's first Havering Young Residents (HYR)'s meeting "Being young in 21st century Havering" (3pm on Saturday 23rd February at Hornchurch Library) is to get together a handful of my generation, listen to their concerns as young residents in our borough, and create a lasting domino effect that will get young people engaged in politics and our community.